A Facebook friend, Debbie McCreary shared this poster. This is profoundly true. For most people it takes great courage to say, “I’m sorry, I made a mistake.” It is sometimes harder still to be on the receiving end of that apology and to forgive that person. 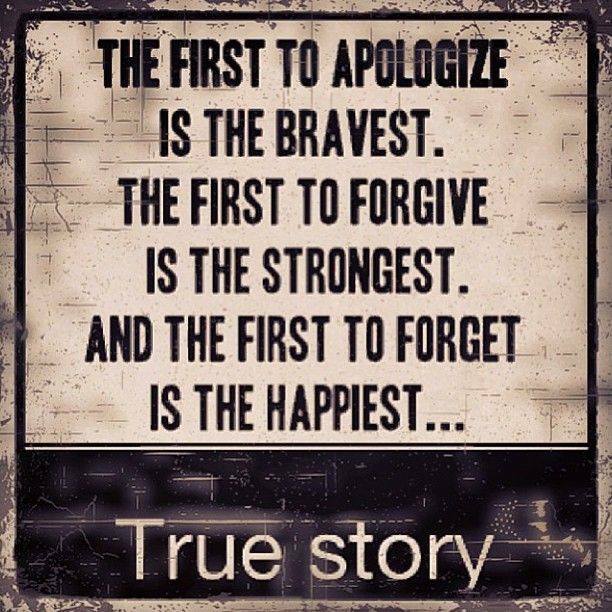 Finally, when both an apology and forgiveness has been offered, the last step, forgetting the offense is perhaps the hardest but the most rewarding. Although there have been very few negative reviews of Highland Solution, in two of them, the reviewers commented that problems were resolved “too easily.” I strongly disagree with this assessment. When either the hero or heroine makes a mistake, they discuss it fairly quickly, the one who needs to do so apologizes, forgiveness is offered and they move forward. This works for me in real life, and I have managed to stay in love and married for almost 23 years. Therefore, it is what my characters do. Perhaps more difficult than accepting an apology and choosing to forgive and forget is choosing this high road in the absence of an apology–when the other person does not acknowledge their offense. I can honestly tell you, I stink at this. Katherine, the heroine in Highland Solution understands the strength it takes to forgive and the peace that is found in forgetting. She lived in an abusive situation for years but when she rides away, it is behind her. She doesn’t dwell on it, and never seeks to right old wrongs. Niall, like me, can’t do this very well. One reason Niall is so bitter towards women to start with is that he holds onto past hurts. His step-mother was cruel and self-serving. She would never have recognized her actions as wrong so she would never have apologized. He tries to ignore her, but avoidance is not the same as forgiving and forgetting. Her actions have colored his opinion of all women. He cannot forget. The same is true for the first woman that he thought he loved. She cheated on him, breaking his heart and embarrassing him publicly. She never asked for his forgiveness and he never offered it unilaterally. Thus he carries the pain and hurt he suffered at the hands of both of these women forward and it colors his actions.